Here Lulu leads the way into the backyard. We got her from the Frankfort humane society in 1998, shortly after we bought the house. They point out the entrance to the backyard. If you have a great privacy fence but no arch, the location of the gate is not obvious. Good ones look very graceful, and are simply pleasant to look at. By partly obscuring what is beyond them, they create a sense of intrigue. So I guess that makes arches the the lingerie of the garden. 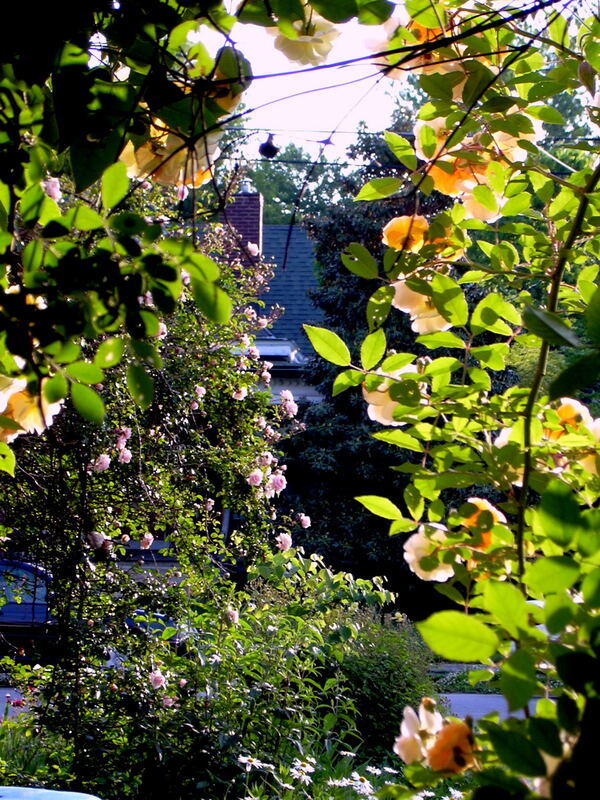 By partly obscuring what is beyond them, they create private spaces in your yard. Our back porch feels very private, even though the house next door is only maybe fifteen feet away from it. 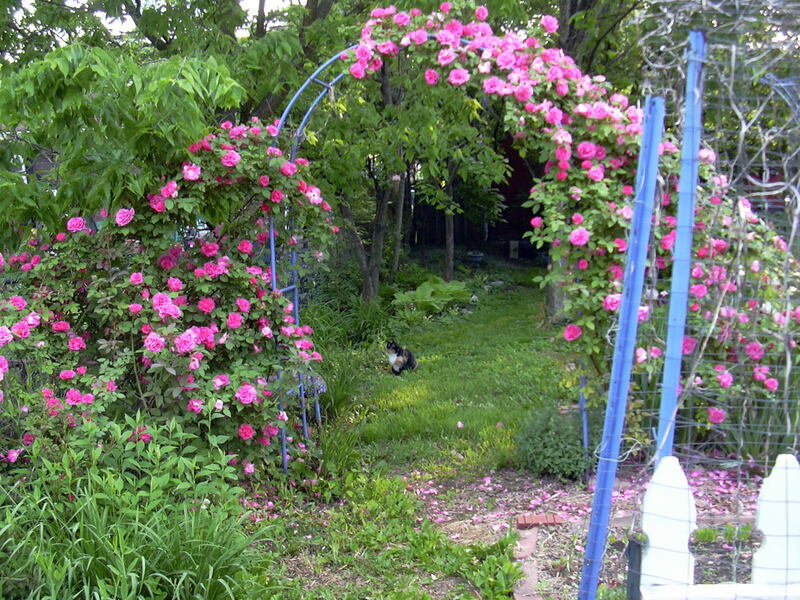 Since sunlight can reach all sides of the arch, they’re the best way to grow climbing roses and get a lot of blooms. 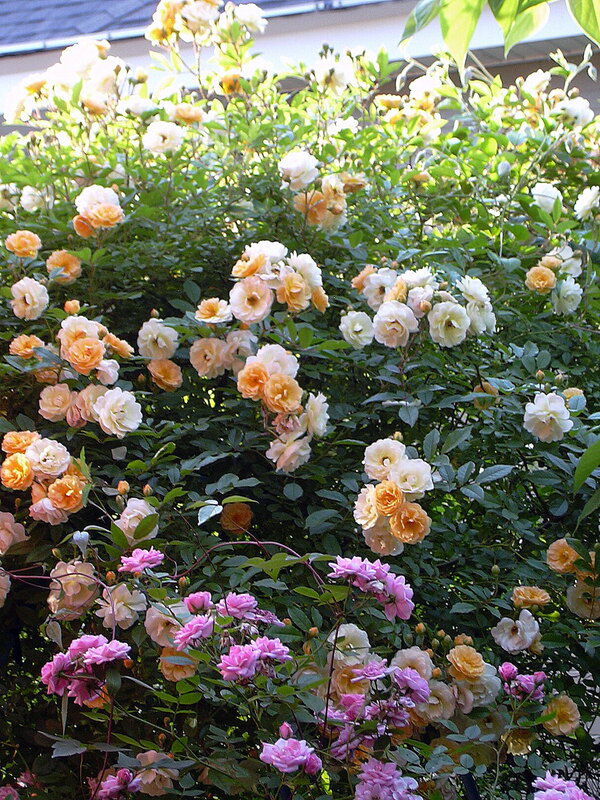 Birds love to nest in roses that grow in arches. The arch you see here provided nesting space for a family of cardinals last summer. Looking back out through this same arch is also marvelous. The rose is Ghislaine de Feligonde. Kate Black started me this plant after I admired hers. Kate is an organic rose gardener who lives in Bell Court and also owns the house behind hers on Walton Avenue. She has achieved the gardener’s dream: when you run out of space in your own yard, just buy the house next door and keep going. Here is another shot of Ghislaine, here with the pink miniature Jeanne La Joie, who has languished in a bourbon barrel for years. This winter/early spring, I will bust her out of prison and plant her in a spot with real dirt. 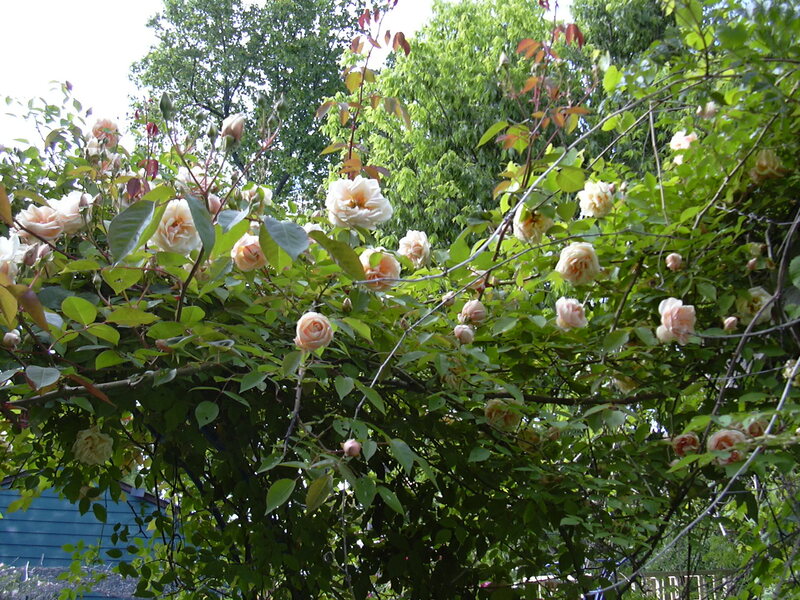 The rose here is Zephirine Drouhin, a thornless Bourbon climber. The cat is Teeny, who followed me and Bob home from a walk in July 2006. 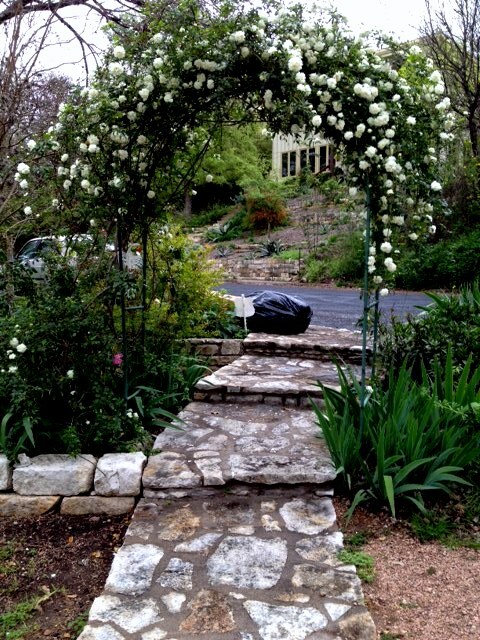 I added this arch because I had started the plant on the left from the mother plant on the right, planning to give it away [I do spread the good news about roses at every opportunity] and the new plant had gotten too big to give away. I had to do something, so I got this arch and visually joined them. Much better. I love this particular kind of arch: it’s about six feet wide and nine feet high, say seven and a half once installed. I get mine from Jackson and Perkins — their prices are high for most things, but I think these are still a bargain at a hundred dollars a pop. They are steel and VERY strong, last for years. Arch in Austin, Texas, with Fortuniana, March 2012. This arch is in Austin, Texas. My sister Kamilla has allowed me to colonize her yard with roses and irises from the old house that was going to be bulldozed. I wish I had another shot this arch in bloom. The black garbage bag in this one — well, I don’t have time for Photoshop, so here it is again. I doubt that’s a body in the bag. They live in a nice neighborhood. It does somehow interrupt the view of her front porch from the street, so that the porch and yard both feel more private and more inviting to sit on. They’re installing a fence to corral my niece somewhat, so I will I hope get updates on those structures in July or August when I visit her next. Back in Kentucky. Reve D’Or on the arch screens the compost pile, which is a thing of beauty to a gardener, except for its cinderblocks. This arch also has produced one brood of robins already this year. This entry was posted in rose pictures, Structure and tagged design, Environment, exterior spaces, Home, Nature, rose photos. Bookmark the permalink.